Tze Goh, a last season’s one-to-watch that had caught my eye, invited me today to see his third collection that he presented in form of a film at the Somerset House. 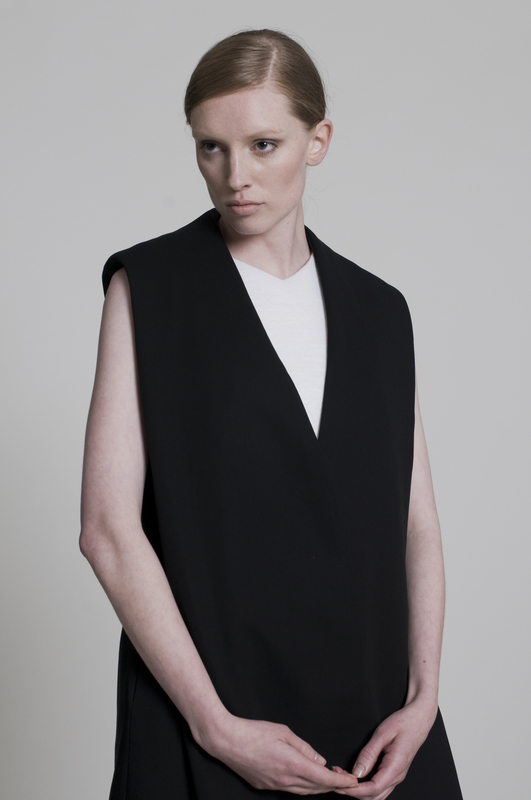 For SS 2012, Tze Goh's collection challenges traditional tailoring with garments that evoke structural fluidity. In black and white he told the story of twin girls that, after a resinous approach, are finding a connection in the end, one of them whispering into the other’s ear. Was it a secret? Was it an apology? We will never know, but remember that the collection, as the film, is all about contrasts. Hard lights had been beautifully used, in which the two impersonators are moving homogenous through the placeless, plain background, one walking into the grainy image area and blurring in with the background. The classical music underlined the mood perfectly. Linen knit dresses, gazer lined collars and bonded 3D jersey minis form a collection which is pure and minimal. The pure, round silhouette from London-based Tze Goh’s last collection got adopted into a new entity with augmented classical influence of men’s cuts and the aerodynamics of airplanes, all in black, white and beige, punctuating the minimalism as the aesthetic signature of the Singaporean designer. Through Goh’s deft construction skills a streamlined silhouette becomes feminine, and weightless surfaces remain sensitive to the wearers form. Tze Goh definitely remains one to watch. Through Goh's deft construction skills a streamlined silhouette becomes feminine, and weightless surfaces remain sensitive to the wearers form.